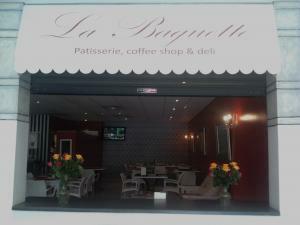 La Baguette patisserie, coffee shop & deli opened its doors in Stellenbosch Square in October 2011. We are open every weekday from 07h30 to accommodate your business breakfast meetings . We furthermore have a daily lunch special which varies daily. This is to accommodate everyone that only has a limited time to enjoy a quick lunch to get back to the grindstone. We also have an extensive lunch menu which includes quiches, Burgers and pastas to name a few. Another service that we offer is to cater for your in-office meetings and/or sales conferences. This can vary from platters to hot meals for all. We are very proud off our genuine French Quiches, Croissants and Baguettes that we bake daily. When we say genuine French we mean genuine – it is made of the finest French flour imported to our French pastry Chef weekly. We bake all our own quiches, breads, croissants, cakes and muffins. And our coffee is not to be sniffed at either! From Flat whites to Espresso’s – if you have not found the perfect cup yet – come try us! We pride ourselves on the quality of all that we offer – I have even gone so far to say that we “set the bar”. For a coffee shop/restaurant/patisserie with a difference – La Baguette will not disappoint you.